How Much Will A Car Alignment Cost? If you drive, wear and tear is a fact of life. In addition to being a safe driver, having your car regularly aligned can help extend the life of your vehicle and your tires -- and keep you driving safely and smoothly. What Is A Car Alignment? As you might imagine, a car alignment requires aligning components of your vehicle to meet certain specifications. The three parts that the mechanic will inspect are the caster (located between the steering mechanism ball joints -- this impacts steering), the camber (the angle at which your tires hit the road -- this impacts how quickly your tires will wear down), and the toe (the angle between the tires -- this impacts the safety of your turns). The mechanic will sometimes also analyze how well the vehicle drives on the road to check for any issues before starting work, like a vibrating steering wheel or veering to one direction, both of which signal alignment issues. The mechanic will also make sure your suspension parts are in good working order, which is essential to safely driving your vehicle. Using their eyes and an alignment machine, he or she will ensure the casters, cambers, and toes are aligned at the proper angles recommended by the manufacturer. After completing repairs, the mechanic will test the alignment on an alignment rack and will typically take it for a test drive to make sure everything is in working order. A standard car alignment should only take an hour or so to complete. If you are just getting two of your wheels aligned and your car does not have any particular issues or abnormal designs, you can expect to pay between $50 and $75, while a full vehicle alignment will cost double that amount. If you require additional services or have issues with your car’s suspension or tire balance, the mechanic might need to repair these issues in order to properly align your tires, driving up the cost of an alignment. Likewise, a specialized or peculiar car design may be trickier to repair and thus cost you more. Some companies that perform alignments offer limited or even lifetime warranties on their work. If you drive often through rough roads and plan on keeping your car for a long time, this can be a good idea. Why Do I Need A Car Alignment? Properly aligned vehicles steer more precisely and safely -- and give your tires a longer life, saving you money down the road. If your tires are not hitting the road at the proper angle, they will wear down faster and also have less of a chance of safely getting through tough situations like mud, snow, quick turns, and inclement weather. Poorly aligned tires also don’t absorb shock, as well as aligned ones, do meaning your gas mileage could go down and your ride could be a lot bumpier. You should try and get an alignment every 10,000 miles. If you have any issues with steering your vehicle, unusual amounts of road noise, or uneven wear on your tires, it is time for an alignment no matter how many miles you’ve driven. How Do I Choose The Best Place For A Car Alignment? Any established mechanic should be able to offer you a car alignment service, and many even give a free alignment check to let you know how desperately you need one. In order to make sure your mechanic is qualified to safely complete a car alignment, make sure they are ASE certified (recognized by the The National Institute for Automotive Service Excellence). 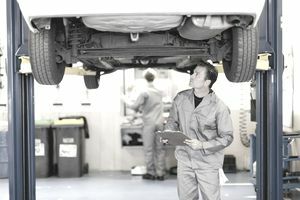 If a mechanic suggests you need expensive suspension work beyond the basic alignment, make sure to get a second opinion. Will Insurance Cover Car Alignment? If you are hit by another driver, the other insurance company will almost always be required to cover the cost of your car alignment. They might try and dispute it, saying that there is no way the small accident caused alignment issues, but you can and should always push back. If you are simply getting a routine car alignment, your insurance will probably not cover the cost. Some major cities that are riddled with potholes offer a way for those who drive on their roads to be reimbursed, however, they do not make it easy and it is most likely not worth your time. If you have collision coverage and hit a large pothole, you might be able to get your alignment covered as well but since your deductible would apply it pretty much makes it a nonpoint unless your damage is more than a misalignment-- ask your insurance agent about pothole coverage. What is the Best State to Buy a Used Car?